Two school pupils have been very clever. They have made a special device that picks up what people say with their hands, using sign language. Then, the device writes it down on a phone screen. They won first prize at the Viet Nam Science and Technology Fair for their device. “When I tried to talk with the deaf and mute people, I discovered that I was communication-impaired myself. I did not understand the sign language that they were using, while most of them could understand what others were saying by reading mouth movements,” said 17-year-old Tân. “We cannot foretell anything about the future, but we wish to introduce our product to the market or transfer the technology to other researchers who can continue to develop it and make it a really useful product for deaf and mute people," he said. The first prize in the Viet Nam Science and Technology lFair has only fuelled their aspirations. They dream of attending top-notch scientific and technological centres in the world where they can take their scientific passion to greater heights. Gloved hands are hands on which a person is wearing gloves. A pantomime is a type of theatrical production. To decipher means to work out what is being said, or written. “Tôi yêu bạn (I love you)", they said, conveying a core message to deaf and mute people from two students, Phạm Thiên Tân and Chử Hoàng Minh Đức, of the Lê Hồng Phong High School for gifted students in HCM City. A core message is a main message. “When I tried to talk with the deaf and mute people, I discovered that I was communication-impaired myself. Communication-impaired means not able to communicate well. Mute means unable to speak. 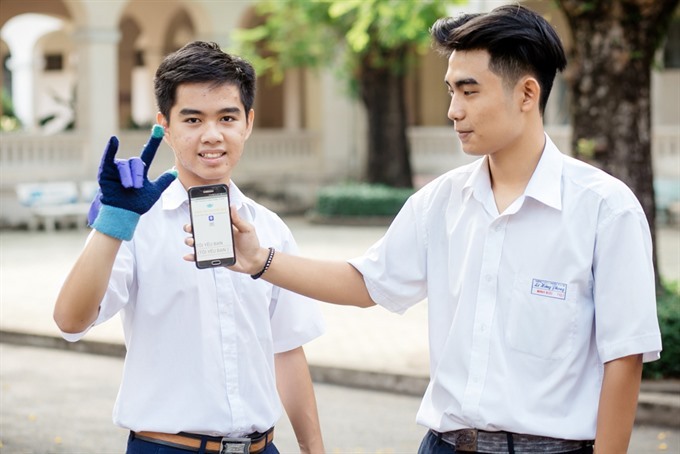 Obsessed by this barrier for days, Tân and one of his classmates, Đức, came up with the idea of a glove that is capable of converting sign language into spoken Vietnamese. If you are obsessed with something, it is in your mind a lot. This would help normal people understand the language of the deaf and mute people and remove an invisible linguistic barrier. If something is invisible it cannot be seen. Linguistic means to do with language. Initiative, in this case, means enterprise. The solution that the two high school students came up with involved a glove and a smart phone. A solution means an answer. When the wearer uses the sign language, the sensors will read the movements of the hand, and transmit the data to the phone via an application based on the Android system. A sensor is a measuring device. To transmit means to send. The sounds that the phone utters now is the sweet and young voice of a female student who is a member of the science club at the Lê Hồng Phong High School for gifted students. Tân and Đức have so far successfully transcribed 31 hand movements into sounds and speech on the phone. If something is transcribed, it is written down. “As students majoring in physics, both of us are interested in controlling the chips." To major in physics means to take the subject up to the final year in a degree. Chips are microchips, a tiny wafers of semiconducting material used to make an integrated circuit. "The science club of our school is where Đức and I can engage in our passion for inventing new things,” Tân said. A passion is a feeling of being so keen on something that it does not matter how much time or money you spend on it. To invent something means to have an idea and be the first person to make it into a device. “So far, we are continuing to study and absorbing knowledge essential for improving our product,” Tân said. Foretell means saying what will happen ahead of the time. If two things co-incide, they happen at the same time. Interact means communicate very directly by being very involved. Possess means have, or own. According to Võ Mạnh Hùng, physics teacher at the Lê Hồng Phong High School, Đức and Tân’s talking glove has high applicability because it uses Vietnamese and prioritises Vietnamese users. To prioritise Vietnamese users means to make them the most important and put them first in the line to be helped. “In terms of technology, the more we work, the more we felt deficient. Being deficient means not having enough of something. Many components broke down, and they were not cheap, so we had to be very careful,” Đức recalled. Earlier, Tân and Đức had collaborated to make other products like a machine to measure alcohol levels and an astronomical telescope. An astronomical telescope is a device used to look at the stars in the sky. The first prize in the Viet Nam Science and Technology Fair has only fuelled their aspirations. If the fair fuelled people’s aspirations, it gave them more hope. 1. Sign language is used mostly by people who are deaf and cannot hear. 2. When using sign languages, people try to make their sentences as long as possible. 3. Phạm Thiên Tân and Chử Hoàng Minh Đức attend school in Da Nang. 4. Phạm Thiên Tân and Chử Hoàng Minh Đức are friends. 5. When Phạm Thiên Tân and Chử Hoàng Minh Đức were working on their device, they found that people from New Zealand were doing much the same type of work.